With its 25th anniversary in the books, CES Boxing is on the fast track to securing another quarter century of success with a handful of new signings and reacquisitions to beef up its already-loaded roster. The list includes a mix of new faces and current fan-favorites, perhaps none bigger (literally) than 6-foot-9, 248-pound Nigerian heavyweight Raphael Akpejiori of Miami. Trained by former two-time world champion Glen Johnson, Akpejiori transitions from the hardwood to the boxing ring this fall when he makes his professional debut on CES Boxing’s Sept. 14th event at Twin River Casino. The heavy-handed slugger, nicknamed “The Nigerian Hurricane,” played college basketball and football at the University of Miami, where he shot 42 percent from the field for the Hurricanes from 2010 through 2014. As a graduate student at Miami, he joined the school’s football team as a tight end despite having never played football in high school. Akpejiori debuts in a four-round clash against Texas’ Omar Acosta on Sept. 14th. The heavyweight division is as hot it’s been in decades and CES Boxing is looking to stake its claim with Akpejiori joining stablemates Juiseppe Cusumano (16-2) of Sicily and Philadelphia native Paul Koon (3-0), another recent acquisition. A longtime advocate for women’s combat sports, both in boxing and mixed martial arts, Burchfield also signed female lightweight sensation Shayna Foppiano (1-0, 1 KO) of Everett, Mass., who makes her CES Boxing debut Sept. 14th. Foppiano joins a long list of female fighters who rose to fame under the guidance of CES Boxing, including former three-time world champion Jamie Clampitt, former lightweight title-holder Elizabeth Mueller, two-time world champion Missy Fiorentino, former WBC middleweight world champion Kali Reis, world-title challenger Aleksandra Magdziak Lopes and two-time champion Shelly Vincent. “From the first CES fight that I attended as a spectator, I felt much more than just a team feel, but more of a family feel,” Foppiano said. “Mr. Burchfield has a way of making you feel like this is exactly where you belong. Observing each bout, Mr. B would walk out with each of his fighters and not leave their side, always showing that he has their back, and I knew that was something I wanted to be a part of. CES Boxing is also proud to announce the re-signings of regional standouts Nick DeLomba (13-2, 3 KOs) of Cranston, R.I., Elvin Ayala (29-10-1, 13 KOs) of New Haven, Conn., welterweight Marqus Bates (4-2, 3 KOs) of Taunton, Mass., and unbeaten Pawtucket, R.I., super featherweight Ricky Delossantos (5-0, 1 KO), plus the addition of Colorado super middleweight Marvin Cordova (22-2-1, 11 KOs), a 25-fight vet, all of whom will return to the ring in 2018. A former world-title challenger, Ayala returns to his roots in New England, where he rose to prominence under the guidance of CES Boxing. Born in Reading, Pa., Ayala won his first 16 fights beginning in 2004 and challenged reigning title-holder Arthur Abraham for the IBF World Middleweight Championship in 2008. Following a devastating loss to David Lemieux two years later, the then 29-year-old Ayala returned to CES Boxing and won his next six fights, including a victory over Derrick Findley in 2011 for the WBC USNBC middleweight title. Ayala’s lengthy resume also includes wins over previously unbeaten middleweight prospect Ronald Gavril, plus victories against veteran Aaron Mitchell and Marcos Reyes to regain the WBC USNBC title. DeLomba debuted with CES Boxing in 2013, kicking off his pro career in a six-round bout against Jimmy Smith of Maine. His impressive early resume included a narrow win over Connecticut rival Edwin Soto in 2014, plus a knockout win over Juan Rodriguez Jr. a year later at Twin River after getting knocked down in the opening round. In 2011, DeLomba upended previously unbeaten regional rival Freddy Sanchez and later defeated Connecticut’s Oscar Bonilla to capture the vacant New England Super Lightweight Title. The slick, 28-year-old right-hander has won three of his last four, including victories over southpaw Amos Cowart in 2016 and a win over Louis Cruz in December to earn the UBF All-America Super Lightweight Title. DeLomba will keep busy in 2018; he recently won his first fight of the year July 18th in New Hampshire and returns Sept. 14th at Twin River to face unbeaten Irish junior welterweight Ray Moylette. Bates and Delossantos are two of the newest additions to the CES Boxing roster, both fighting their entire career under the company’s guidance before signing long-term deals in 2018. The 32-year-old Bates has won four of his last five after suffering a loss to Miguel Ortiz in his professional debut. The brother of former University of Maine and New England Patriots linebacker Trevor Bates, the elder Bates flattened Arturo Lopes and Aaron Moniz via first-round knockout and then pieced together his most complete performance May 11th at Twin River with a dominant win over in-state rival Mohammad Allam, ending the fight via third-round knockout. Bates makes his Foxwoods Resort Casino debut Oct. 20thagainst Connecticut’s Carlos Hernandez. Delossantos, also a late-bloomer in the sport after making his professional debut at the age of 27, recently earned his first-career knockout win February 23rd against Efren Nunez and followed that up May 11th by winning all four rounds in an unanimous decision win over Washington, D.C., native James Early. He has dominated the regional scene in the 126-pound weight class with victories over Massachusetts natives Philip Davis and Jonathan Perez. 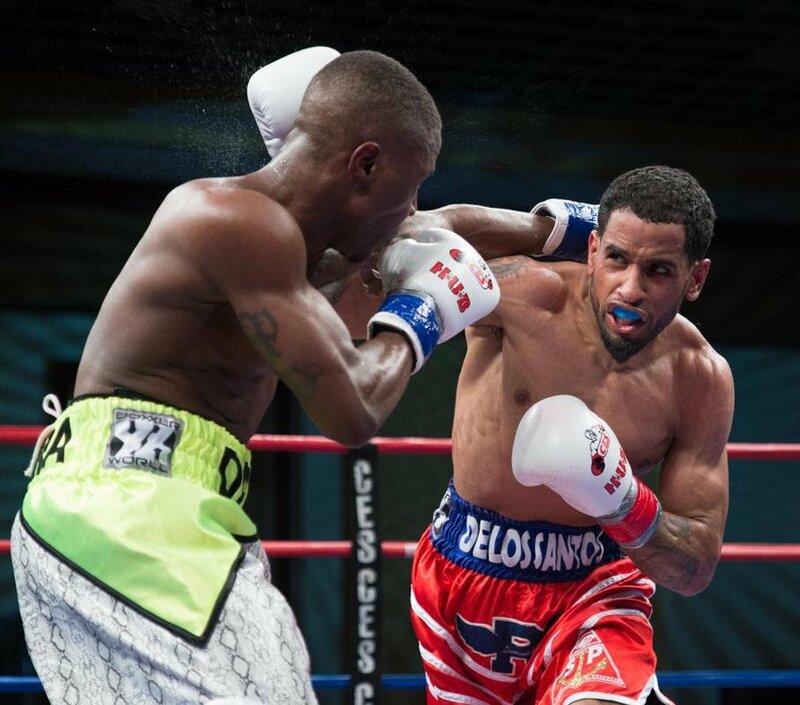 Delossantos returns Sept. 14th to face Jersey City vet Jose Ortiz. Cordova joins the CES Boxing family after ending a seven-year layoff in December with a win over Eduardo Flores in Colorado. The 33-year-old righthander also faced former WBC world welterweight champion Victor Ortiz in 2007 after winning each of his first 12 fights and later that year went on to win the WBC Youth World Super Lightweight Title by defeating Javier Carmona via eighth-round knockout. A year later, Cordova captured the NABA 140-pound title with a win over Derrick Samuels in Las Vegas. He also faced former WBC Silver Welterweight Champion Josesito Lopez in 2010, his final fight before launching his comeback in December. Fellow newcomer and former Southern New England Golden Gloves champion Victor Reynoso of Providence also joins the CES Boxing roster after signing a promotional agreement earlier this year and will make his professional debut Sept. 14th fresh off his trip to the 2018 Junior National Championships in Aurora, Ill. Joining him will be another new stablemate, Nicholas Briggs of Worcester, Mass., a former Ringside Tournament Champion and decorated amateur who finished with a 50-17 record. Briggs faces Jacob Wright of Alabama in his professional debut Sept. 14th while Reynoso battles Ecuadorian Maurilio Alava.